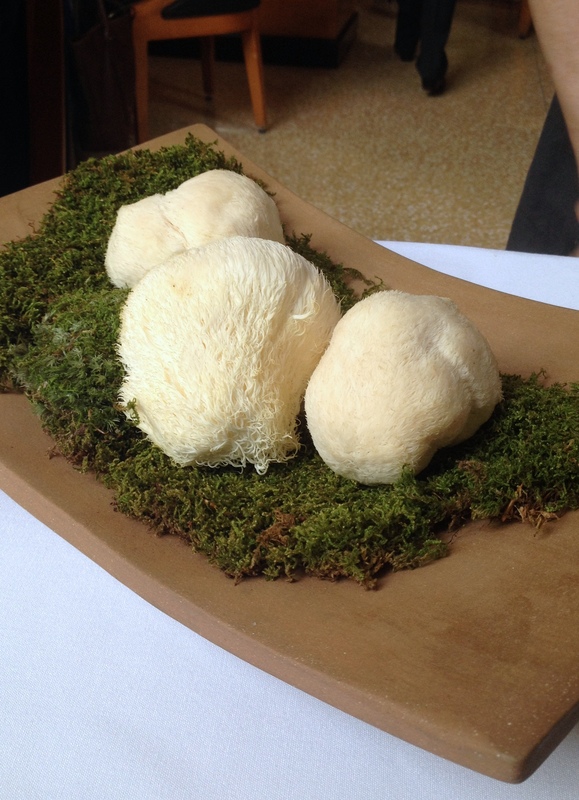 Eleven Madison Park serves a French degustation menu with a New York twist ($225 a head). The ingredients are sourced from the New York area and surrounding states and provides the diner with an opportunity to experience the flavours and essence of New York. The meal was a journey of discovery which began with the entire table being asked to choose from either venison or duck for the main. We were also mysteriously asked to choose between four flavours – apple, celery, cranberry and maple (but more on this later) by punching out the relevant leaf from the card that had been given us to. All this while we nibbled on some delicious cheese biscuits served wrapped in a box. Our first course was a roasted kabocha squash salad with pear, chestnut chips and radicchio. The salad was resounding fresh, with the pear adding sweetness to the salad. The chips were crunchy, but the dressing of squash vinaigrette and white balsamic vinegar was a touch acidic. Seared Hudson Valley foie gras was next. 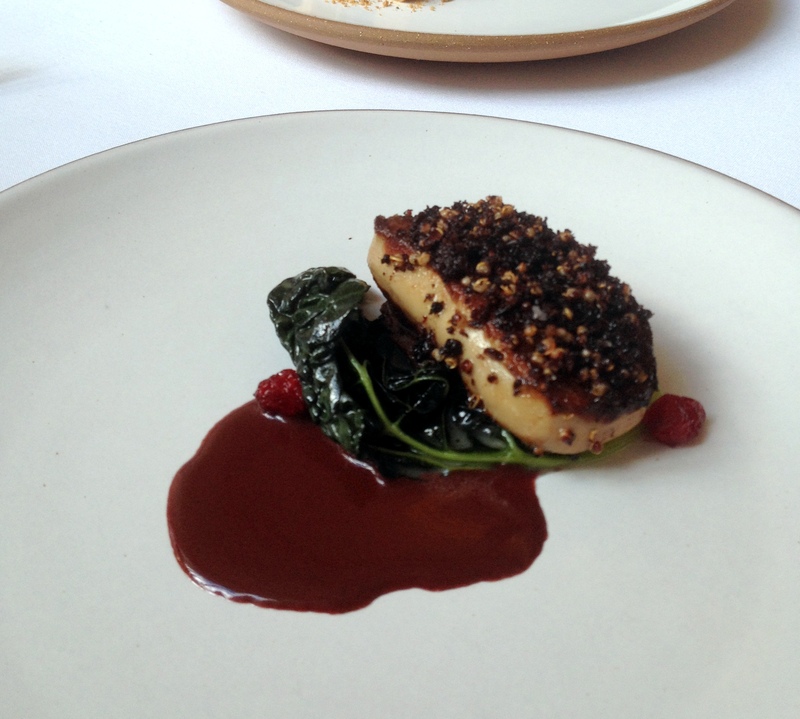 Beautifully cooked, this was a lovely dish with its accompaniments of blood sausage, cranberries and kale. 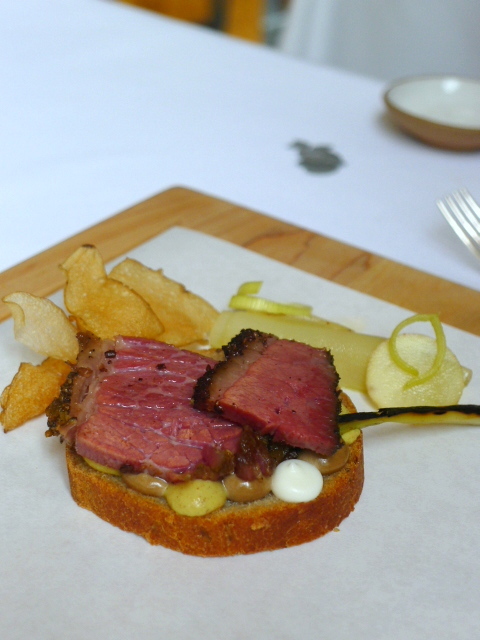 A platter of home cured beef pastrami with rye bread and pickled leek followed in what was an imitation of a New York style deli. Here we made our own open sandwiches with condiments of mustard and black garlic aioli. The pastrami was excellent, but it was just pastrami after all. There was also a drink to go with the sandwich and mine was maple flavoured as I had chosen maple from the four flavours offered to us. This was really tasty, proving to be effervescent, refreshing and not too sweet. A seafood taster consisted of four different elements of Long Island seafood. First was a Widow’s Hole oyster with yoghurt and lemon. The oyster itself was delicious but overwhelmed by the strong acidity of the lemon. Scallop with pistachio and apple was ceviche like in its construction but wasn’t to my taste and some marinated blue crab with pickled radish proved to be very salty. 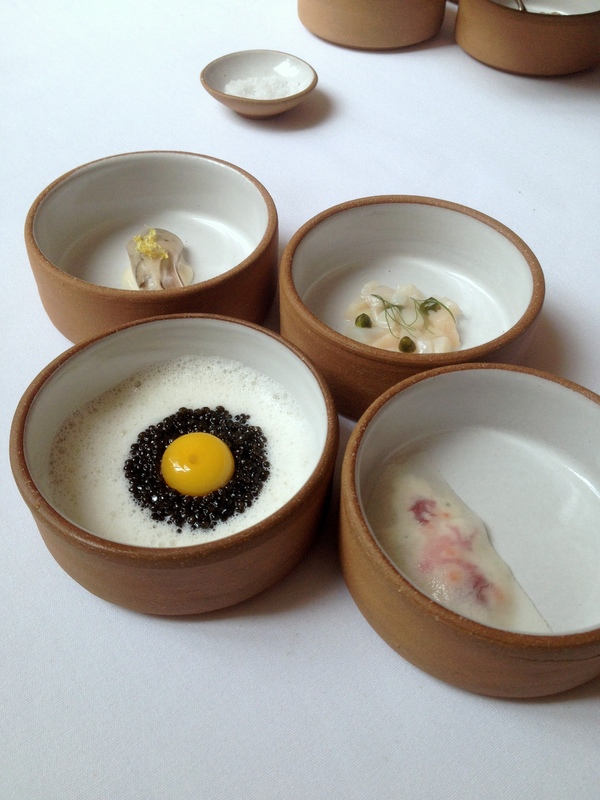 The forth element was a vichyssoise with caviar, smoked blue fish and a perfectly cooked quail egg. This was the most enjoyable of the four selections, but again was a little salty. I did not enjoy this course at all. Slow cooked Atlantic halibut with clams was served with a shellfish parsley sauce. I sent this back as this came out cold. The second time around and the dish tasted better. The halibut was moist and nicely cooked, but the shellfish parsley sauce was quite strong in flavour. I was divided in my opinion of the pairing of the sauce with the halibut although I appreciated its technical complexity as it was deep and rich. 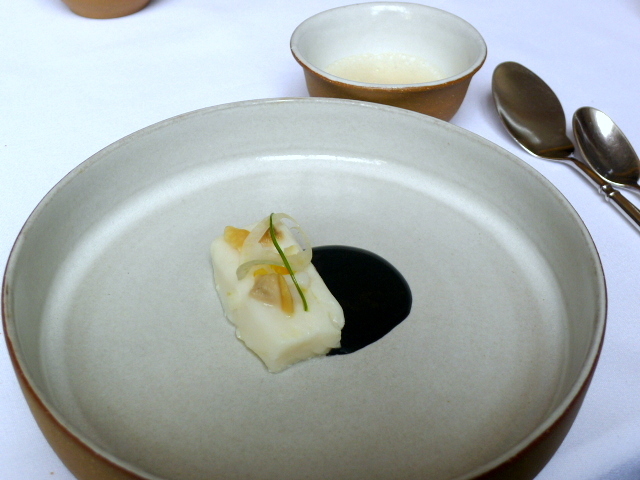 Also on the side was a lovely bowl of silky smooth sea urchin topped with hops and a potato foam. 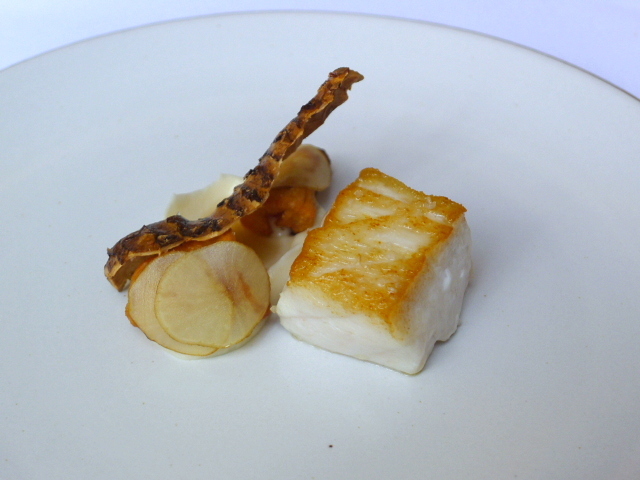 The kitchen sent out another fish plate on account of the halibut being cold, a dish of striped bass with parsnip puree and chip. This dish was lovely with the bass being perfectly cooked and moist. The parsnip accompaniments were also delicious. 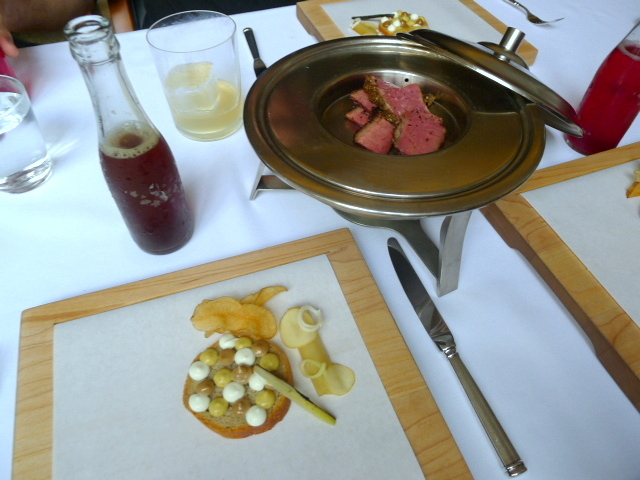 There was an element of interaction with the kitchen at Eleven Madison Park which we really enjoyed. One of the chefs came out to present the ingredient in the next dish to us, lion’s mane mushrooms. 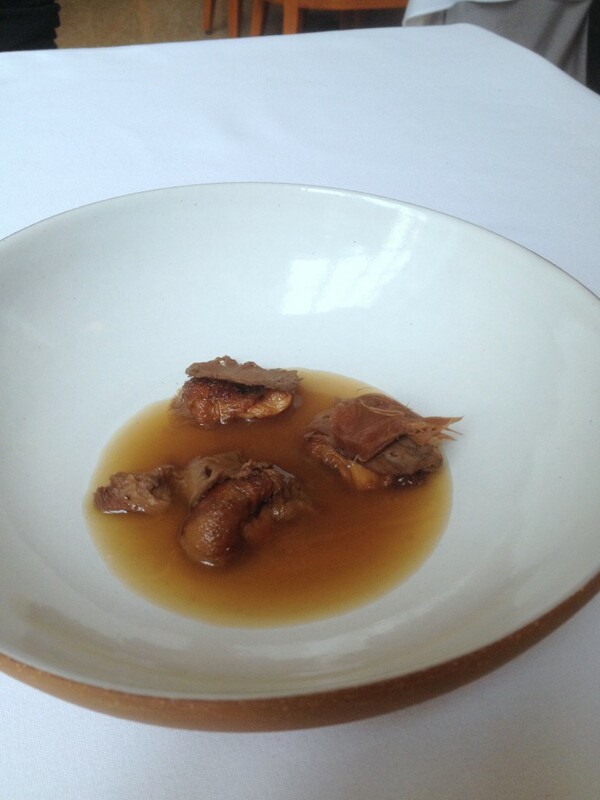 Braised in its own broth, the mushroom itself was beautiful – strong and robust in flavour. But the dish was heavily over seasoned which ruined the natural flavour of the mushroom. We moved onto the meats. Again on account of the cold halibut, the kitchen decided to send out the other meat dish, which in this instance was the duck. More interaction from the kitchen, and this time the chef brought out the whole roasted duck which was a thing of beauty. 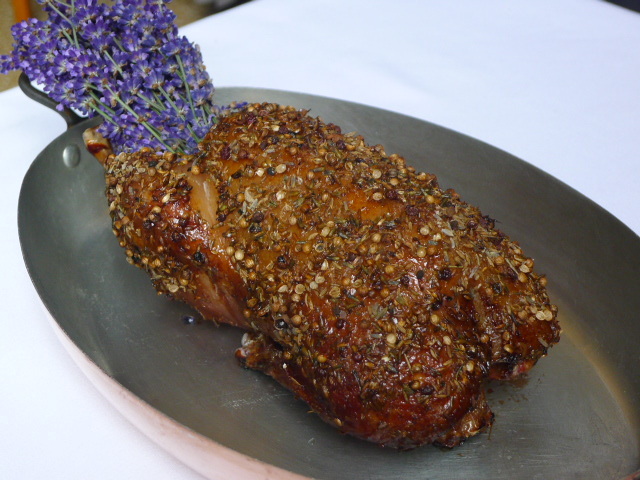 Dry-aged for two weeks, the duck had been roasted with honey, coriander, lavender and other secret spices. Only the breast was served and this was absolutely exquisite. The flesh was tender and rich with flavour, further enhanced by the intricate combination of ingredients in the marinade. I was grateful the kitchen sent this dish out as this was the highlight of the menu. 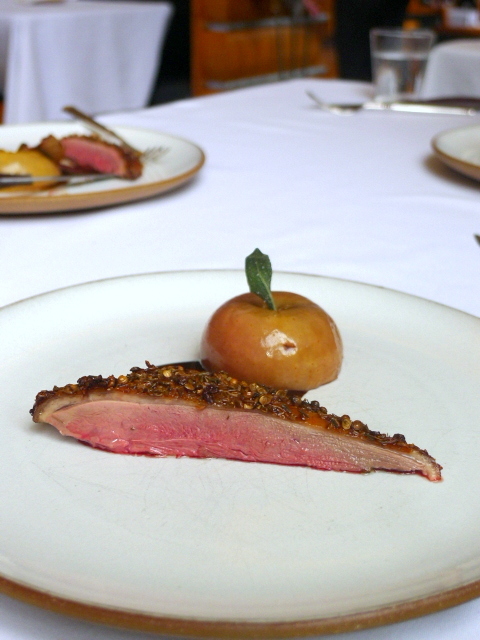 Accompanying the duck was an apple stuffed with a duck farce of offal and leg. The venison was served two ways, firstly as a charcuterie of venison sausage in brioche, venison liver on toast and other cured venison meat. All the meat elements were tasty, although the brioche was a little dry. 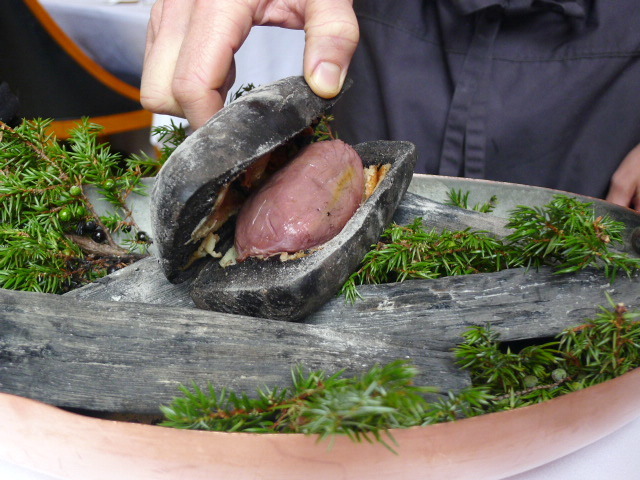 The second was as the loin, slow cooked with an ash crust, which again was presented to us at the table prior to cooking. The loin was incredibly tender with a sweet, albeit not particularly gamey, flavour. 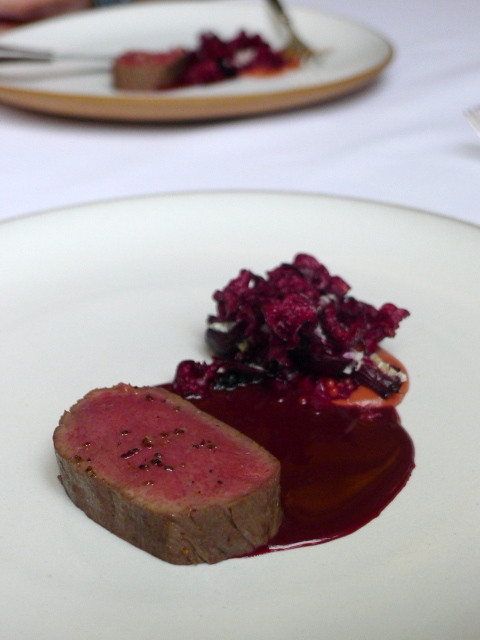 Accompaniment of beets, caramelised onions and venison jus were pleasant and worked with the venison. 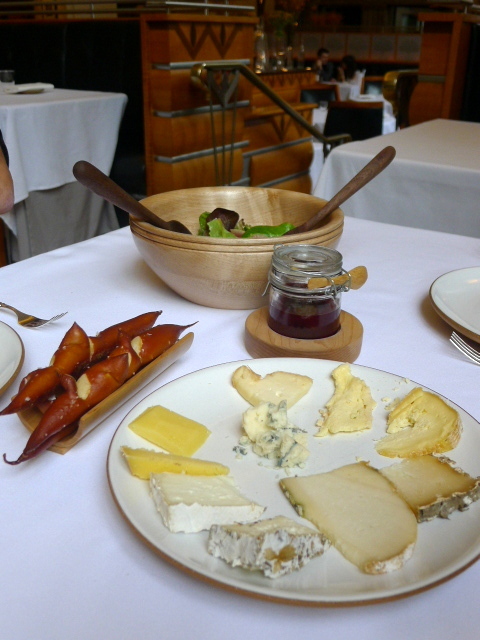 The cheeses included a variety of Jersey cow’s milk, goat’s milk and sheep’s milk cheeses. We tried a variety of different ones and all were reasonably tasty. The cheeses were served with soft pretzels, plum conserve and a bitter green salad. 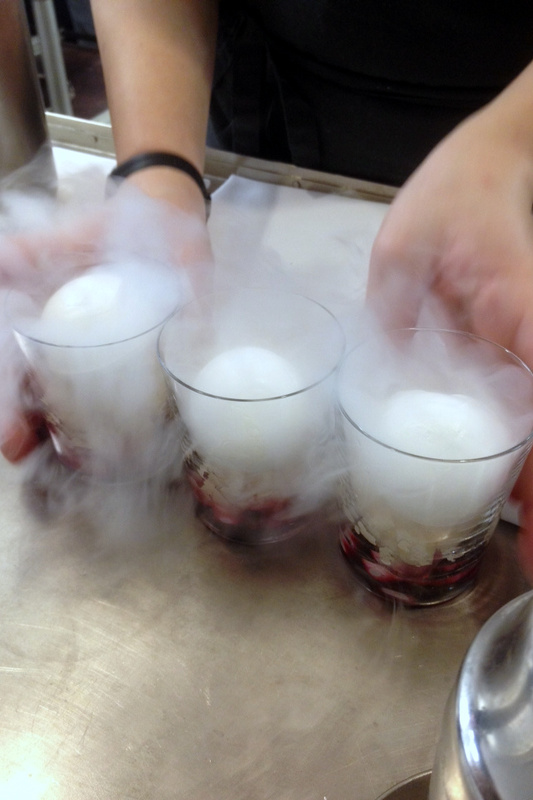 We were taken to the kitchen to watch our palate cleanser being made, a concord grape syrup with lemon meringue and a bourbon sorbet, frozen on the spot with dry ice. There was a nice bit of bourbon which gave this refreshing palate cleanser a little kick. 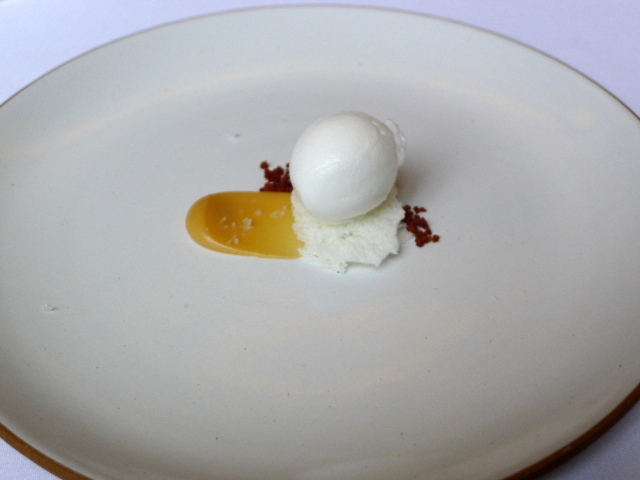 This was followed by a yummy whey sorbet with caramelised milk and milk foam as our pre-dessert. To dessert which was a vanilla baked Alaska with rum and caramel. A gorgeous looking whole baked Alaska was brought to the table and flambéed in front of our eyes before being taken back to the kitchen for plating. 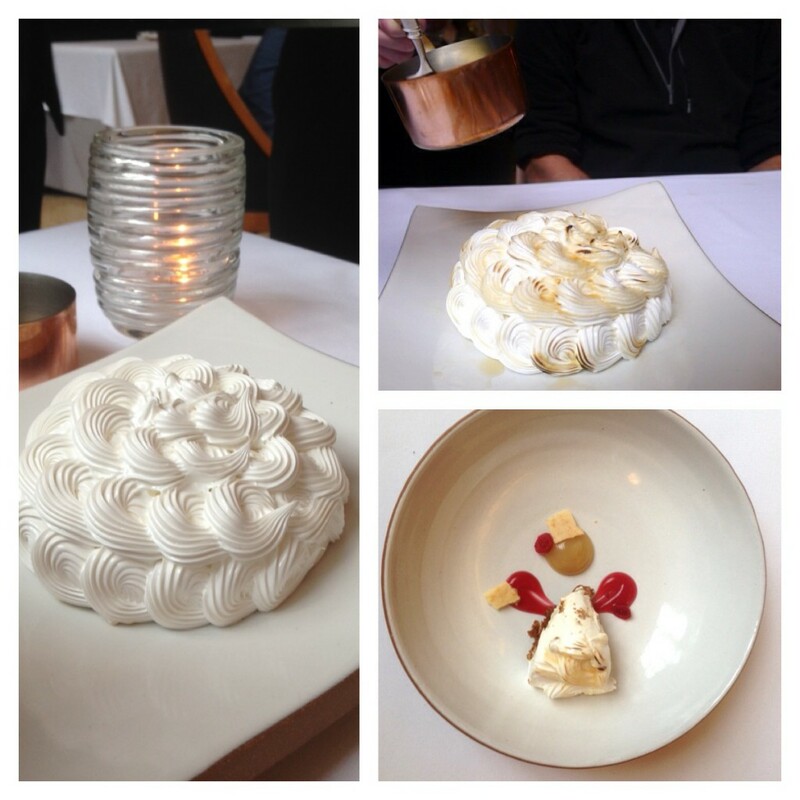 With the fluffiest of meringues and the softest of sponge cakes, the Alaska tasted heavenly. The use of rum and caramel was perfectly judged, and there was also a dollop of maple syrup on my plate which also complemented the Alaska nicely. 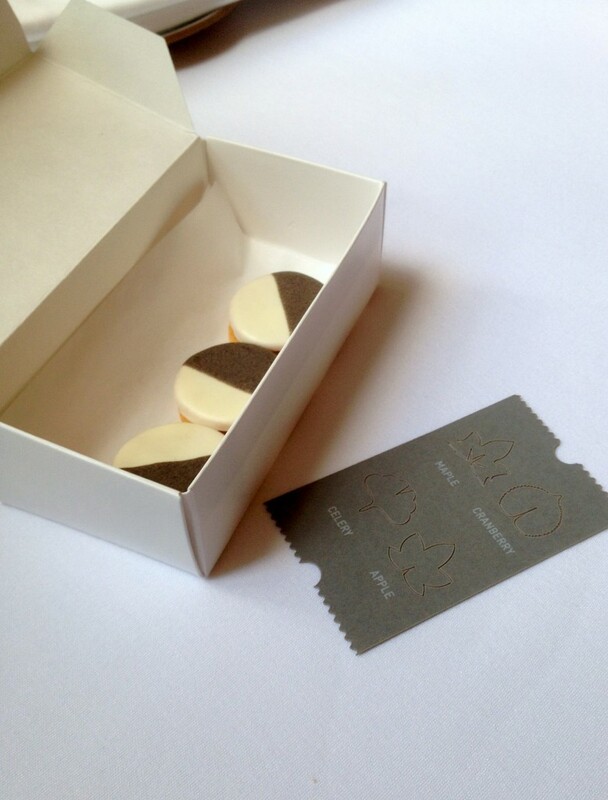 Petit fours consisted of a pretzel chocolate covered with sea salt and black and white chocolate cookies with apple molasses. 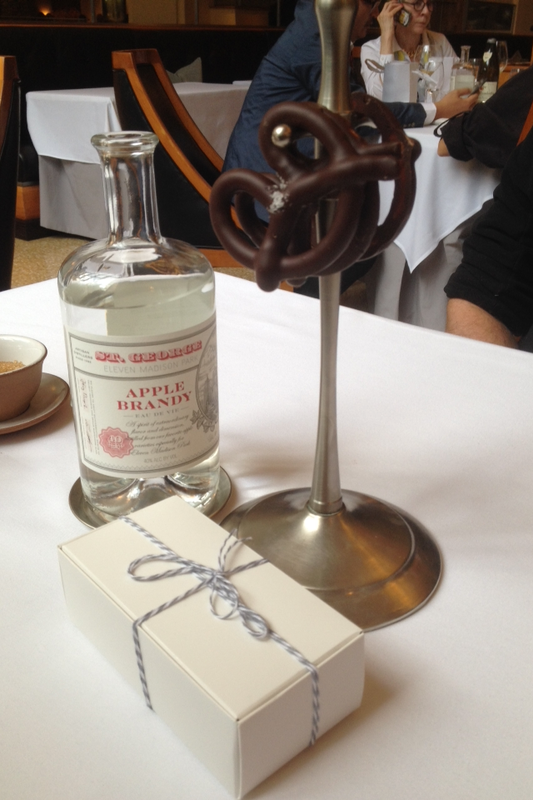 The pretzel was excellent and was made from a mixture of chocolate and about 20% pretzel dough. It therefore tasted more like chocolate with a slight biscuity texture and was absolutely delicious. The cookies were also buttery and tasty. 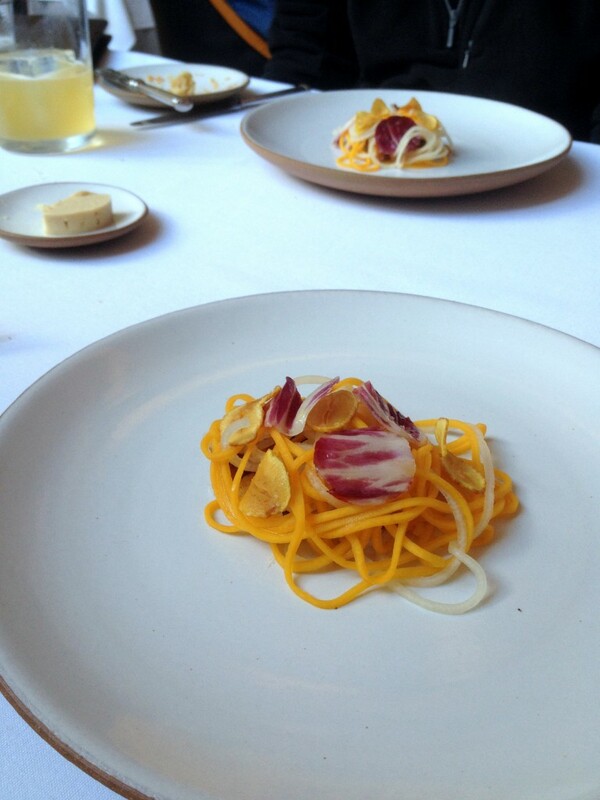 For the most part, everything was beautifully cooked at Eleven Madison Park. We couldn’t fault the quality of the ingredients and we appreciated the journey that the restaurant tried to take us on by engaging with us and sharing the stories behind the dishes. Much care had been taken to create a grandiose experience and the service was exemplary. The result was a long and lengthy meal that lasted for over four hours. 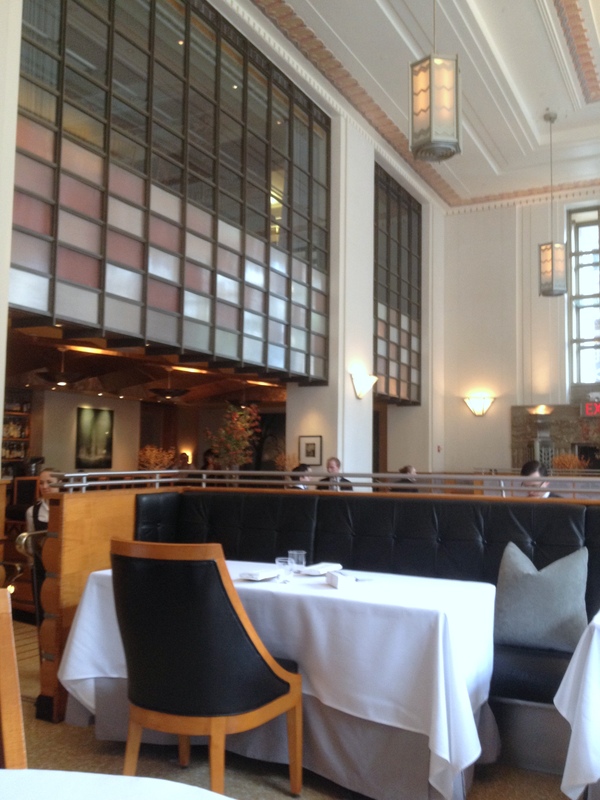 But in truth, Eleven Madison Park did not inspire me with awe, not least because there were a few mistakes and I had been expecting perfection on account of all the accolades it has received. 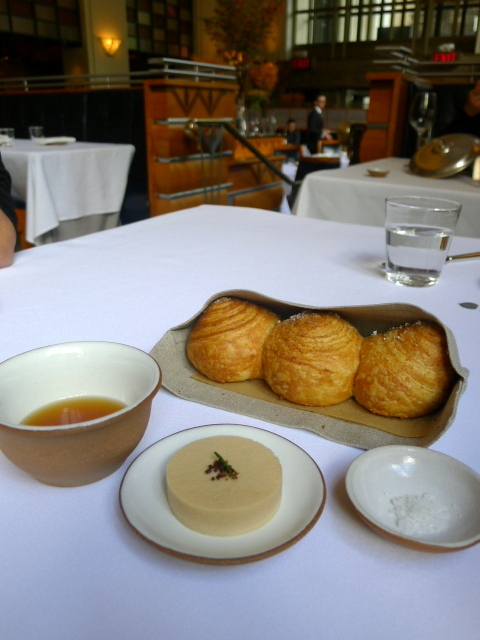 It was also because, other than the duck dish, there were very few dishes that really spoke to me. The menu in its entirety felt quite prim and proper and restrained, and did little to excite my palate. I can see why it has received such enormous recognition – all the ingredients are sublimely beautiful and much thought and care went into the design of the menu. 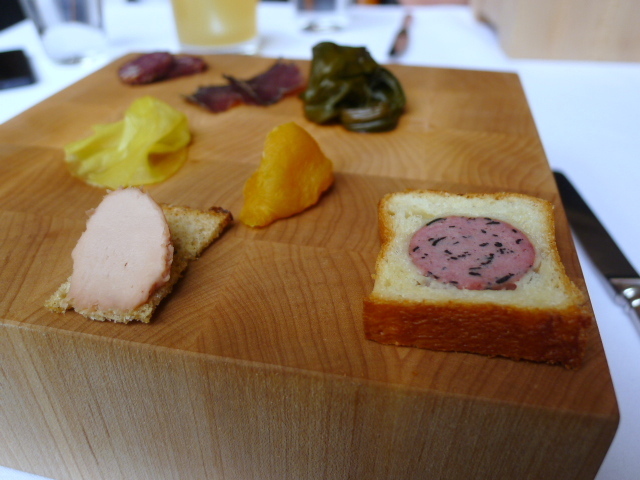 But for me, the menu at Eleven Madison Park was a little underwhelming. This is my humble opinion. Price: The tasting menu is $225. Excludes drinks, taxes and service.